where the demigod Maui snared the sun and forced it to move more slowly across the sky. The grand show is eternal. It is always sunrise somewhere; the dew is never dried all at once; a shower is forever falling; vapor is ever rising. Eternal sunrise, eternal dawn and gloaming, on sea and continents and islands, each in its turn, as the round earth rolls. 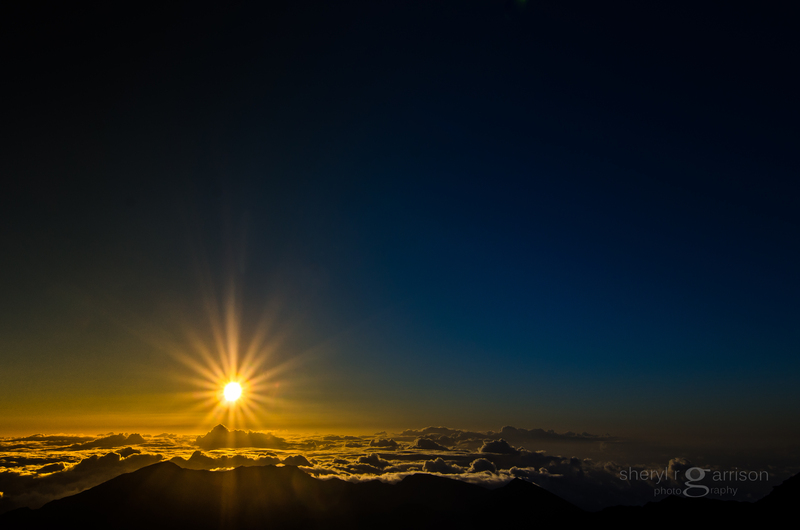 It seemed like the right thing to do, after all I have had a lot of practice lately at getting up after midnight and chasing the night sky so the alarm was set and at 2 AM we began our journey to the 10,023 foot summit of a volcano called Haleakala. I would not have imagined packing my winter down, snowboard under layers and wool hat for a trip to Hawaii but I was really glad that I had! Bundled up and with a Pepsi and pretzels in hand to combat the nausea that I deal with on winding mountain roads, into the Jeep we piled. The drive was as curvy and slow as reported so we were glad that we had gotten such an early start. Upon arrival we made our way up top and I found a good place to set up my tripod, thankfully weighted down by my gear bag as it was cold and breezy. It was a full moon night but I was still pleased to be able to see the milky way with my naked eye and took some shots of it while we waited for the main event. I think that this was the first time ever for me photographing the night sky with a group of people and I do mean group! 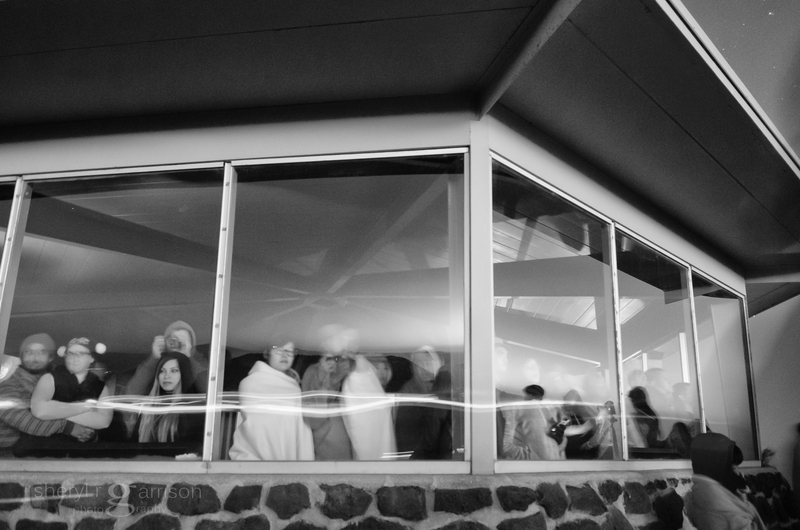 Those of us braving the weather outside had a chuckle at the expense of the ones who looked a little like caged animals staring out from the enclosed and far warmer viewing area; snapping pictures from behind the glass with their flashes on. Being surrounded by some wonderful people from other parts of the world helped to pass the time as my fingers (gloved) froze and my kneecaps shook. Thank God for remotes so I didn’t have to touch my camera! 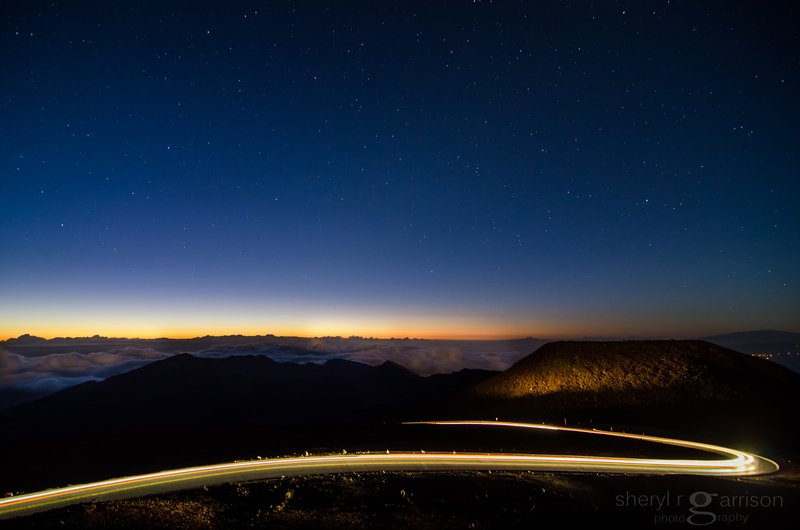 For me the best part of a sunrise is always the time before it comes up and the continuous line of vehicles driving up added some lovely trails to the night sky images. The main event was a moving experience as the sun rose over a bank of clouds and the audience could be heard to say a collective aaahhhhh. The picture of the sunrise is just fantastically wonderful made even better with you words. Thank your for sharing. The quote alone gave me chills down the spine. Participating in a truly unique sunrise experience must have been worth every bit of the discomfort.